A superb opportunity to live in one of Falmouth's most sought after locations perched above the Greenbank and enjoying commanding harbour views. This spacious town house has undergone extensive renovation throughout with even further potential for development to the rear. Wholeheartedly recommended. THE LOCATION Penwerris Terrace and Lane are one of Falmouth's most sought after and valuable residential roads. It is set up high with phenomenal harbour and coastal views, yet within a few minutes' walk from the town and waterfront. The original Penwerris Terrace contains some of Falmouth's earliest and finest Regency houses, several of which were built for Packet Ship captains; the position no doubt chosen for its commanding marine outlook and convenience to the shore. So much of what delights about Falmouth is on one's doorstep at this location. The waterside is a few moments away as is the High Street with its individual shops and galleries, whilst The Boathouse, Star & Garter, or more up market Royal Cornwall Yacht Club and Greenbank Hotel are one's 'locals'. The town has a brilliant and diverse selection of restaurants and an eclectic mixture of shops, which include national chains, such as Marks & Spencer and Sainsbury's, together with quality galleries showcasing local talent. Falmouth's seafront, on the town's southern side, is about a mile away, with sandy beaches, Henry VIII's Pendennis Castle and access to incredible walks and scenery along the South West Coastal Path. Nearby train stations (Falmouth Town and Penmere Halt) provide a convenient link to the mainline at Truro for Exeter and London, Paddington. Falmouth Docks are a major contributor to the town's economy and along with Falmouth University (with campuses in Falmouth and Penryn) and Falmouth Marine School, specialising in traditional and modern boat building, marine engineering and environmental science, ensure an all year round and vibrant community. There are five primary schools and one secondary school in the town and highly regarded independent preparatory and senior schools in Truro. Falmouth boasts the third largest natural harbour in the world and is renowned for its maritime facilities which offer some of the best boating and sailing opportunities in the country; little wonder the town is consistently ranked as one of the top five places to live in the UK. THE PROPERTY 23 Penwerris Terrace is one of our favourite ever Falmouth town houses; having sold it to our clients two years ago it has been a delight to re-visit and witness their huge undertaking of renovation in such a short space of time. The property now offers a fantastic opportunity with nothing to do on move in day and the modernisation has been completed to a high specification with sympathy to its Victorian heritage at heart. The accommodation of the 'main house' comprises two stunning 10ft high ceiling downstairs rooms - one a large living room and the other a kitchen/diner. Up the beautiful turning staircase from the stylish tiled hallway rising to the first floor, a generous landing in turn providing access to two large double bedrooms, family bath and shower room as well as a useful separate utility room. Up a further hidden staircase one is met with a stunning master bedroom complete with walk in wardrobe, shower room en-suite and an exciting dormer window protruding from the roof and giving a perfect 'look-out' point from which to sit and enjoy the stunning panoramic harbour views across the bay. To the rear of the property and accessed via a hallway / boot room at the end of the ground floor is an adaptable part of the house providing multiple opportunities. Currently one large 23ft long room downstairs - perfect as a second reception room, playroom, office or studio space with a landing and bathroom to the first floor. Our clients have sought and had planning permission granted for this part of the house to have a dormer window inserted to the first floor as well as a shower room and kitchen to the ground floor to provide a separate annexe with permission (and we believe with great profit potential) to be a holiday let with private access from the rear. Outside there is a lovely South/West facing garden with multiple seating areas, lawn and all enclosed by attractive stone walls. The property further benefits from off road parking to the front - a real benefit in this area of town. We cannot recommend a viewing of this stunning property highly enough - delightful, characterful, modern family living doesn't come much better! ENTRANCE HALL Grand entrance, stylish newly tiled flooring, doors to reception room and kitchen/diner, hallway leading to rear of house. Open beautiful turning staircase to first floor. Detailed arched coving, window above front door, wall mounted radiator, lighting. LIVING ROOM 17' 8" x 14' 0" (5.41m x 4.27m) A large grand room with 10ft high ceilings, period coving and ceiling rose. Bay sash window to front aspect with working original shutters. Exposed floorboards, high skirting, wall mounted radiator, chandelier lighting. Victorian fireplace with detail surround, cast iron mantle and tiled hearth. Inset working log burner. KITCHEN/DINER 14' 5" x 13' 10" (4.40m x 4.23m) Large kitchen and dining room with 10ft high ceilings. Exposed wooden floorboards, high skirting, coving, wall mounted radiator. Original cupboards built in to recess with shelving. Double glazed sash window to rear aspect in bay window. Pretty Victorian fireplace with wooden surround, slate hearth. Spotlights and low hanging industrial lighting. The newly fitted kitchen comprises; base and eye level units worktop, inset Belfast sink, Rangemaster cooker with five ring gas hob, stylish tiled splashback, extractor over, under counter space and plumbing for dishwasher, space for tall fridge/freezer, free standing central island with shelving. HALLWAY From the entrance there is a hallway past the stairs, wall mounted radiator, under stairs cupboard, newly fitted stylish tiled floor, lighting. Through the door to a useful hallway currently utilised as a boot room with space for coat and shoe storage. Built in wooden cupboards, shelving, window to side aspect and a glazed door to rear courtyard. BATHROOM 8' 7" x 6' 2" (2.62m x 1.88m) Vinyl flooring, velux window to side aspect, tiled floor to ceiling. Three piece white suite; low level flush WC, pedestal basin, large heritage bath with centre stainless steel taps and shower head. Wall mounted towel rail, fitted mirror. STAIRS & LANDING (MAIN HOUSE) From entrance hallway up beautiful turning carpet trim staircase to gallery landing. Double glazed sash window to rear aspect. Landing is a large space with doors to all bedrooms, bathroom and utility. BEDROOM TWO 13' 10" x 12' 4" (4.24m x 3.76m) A large double bedroom, exposed wooden floorboards, tall ceiling, coving, high skirting, inset cupboards, lighting. Large sash window with shutters in bay window to front aspect with water views. BEDROOM THREE 13' 11" x 9' 1" (4.26m x 2.79m) A third double bedroom, exposed wooden floorboards, tall ceilings, high skirting, coving, lighting. Pretty sash window to front aspect, shutters, water views. BATHROOM 12' 0" x 9' 0" (3.66m x 2.76m) A bedroom converted into a lovely sized family bathroom. Exposed floorboards, double glazed sash window to rear aspect with shutters. Radiator, spotlights, extractor, double width shower, roll top bath, low level flush WC, pedestal wash basin. UTILITY ROOM 6' 1" x 4' 10" (1.86m x 1.49m) Previously a shower room now converted in to a first floor utility room with small window to rear aspect. Space and plumbing for washing machine and dryer, wall mounted recently fitted Vaillant gas combination boiler, lighting. 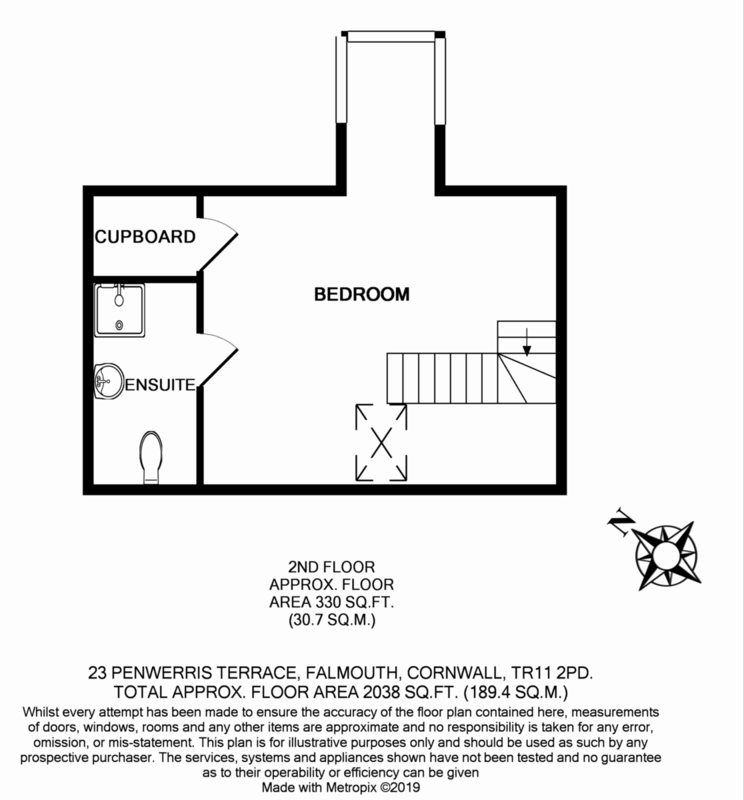 EN-SUITE 9' 8" x 4' 10" (2.96m x 1.48m) Newly fitted lovely sized en-suite, floorboards, spotlights, heated towel rail, extractor, large shower, low level flush WC, pedestal wash basin.